Everyone knows that breakfast is the most important meal of the day. It's also the hardest meal for me to eat. I wake up pretty early in the mornings and so I don't always feel like eating anything. Although now I'm doing a lot better then I was before. I've been making an effort to at least eat a bowl of cereal or an egg in the mornings as I'm working. Between getting the kids ready for school, work, cleaning the house, running errands, etc., breakfast isn't always on my mind much during the week. On the weekend it's a different story since my hubby makes a huge breakfast for our family. Now that I've been eating something in the mornings I've noticed a change in how much energy I have during the day. This is why eating a nutritious breakfast is important. It's not only refueling your brain and body for the day, it also gets your metabolism going so that you have tons of energy throughout the day. That's why I was super excited and happy when I received a huge box of goodies from Kelloggs. Kelloggs has always been a company both my husband and I both grew up with and have also made sure to share Kelloggs with our kids as well. I was excited to see that along with some favorites of mine, Kelloggs had a few new products that they shared with us and we absolutely loved. They now have rice krispie treats that have granola in them. These are my son's favorites. Every time we go to the store and I allow the kids to pick out a treat, this is what he wants, always. They've also made Rice Krispies using brown rice and gluten free, which I think is pretty awesome. I've had a couple bowls and I actually prefer it over the original. The kids loved the Cinnamon Corn Pops. We had already had a box of the original in our cabinets so the kids wanted to mix them both and they thought that was the coolest thing ever, lol. Along with the cereal and treats we got from Kelloggs we also got a shirt and two bowls, which let me tell you, two bowls and four people does not equal enough, lol. These are now our favorite bowls to have cereal or anything in. We love Kelloggs in our house!!! I don't think I've ever seen the mini wheat centres. How did they taste? 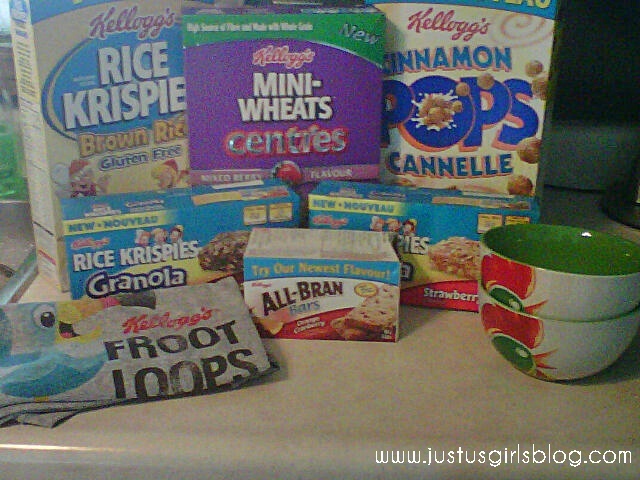 Love kelloggs.. and we love those bowls too! My daughter loves the new corn pops! Yes breakfast is the most important meal of the day. Unfortunately I started mine with sugar!!! Not good! Need to eat some Kelloggs! I'm a huge cereal lover! We have many boxes of Kellogg's cereals flooding our cupboards. I love free bowls!!! Oh yeah, I also love Kellogg's foods! All Bran bars and Froot Loops top the list in my house. We use the Froot Loops for all sorts of day care projects too. We all fight over the rooster bowls too! lol. I am looking forward to trying the Brown Rice Krispies in Rice Krispie Squares! The bowls are awesome! I have to admit that I addicted to the cinnamon corn pops. Who needs milk?